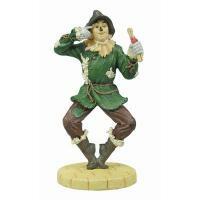 Scarecrow Miniature | Wizard of Oz Globes & More! Figurines | One Price Low Flat Shipping! This miniature figurine of the Scarecrow is perfect as a cake topper, a party favor, a stocking stuffer, or any other creative Wizard of Oz theme occasion with this ever-popular Yellow Brick Road traveler as the star!